Writing has never been an easy task. It’s even harder for non-native writers when they write in English. 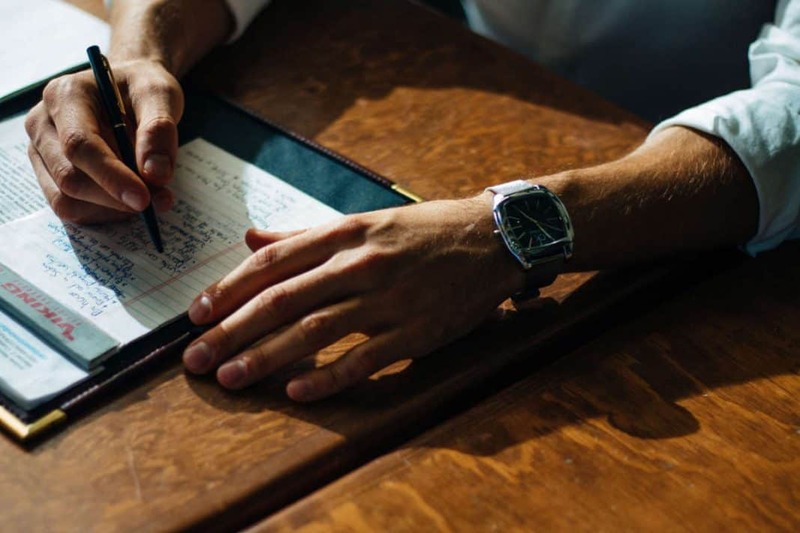 You might sometime question yourself “If I made any grammar mistake?”, “Do I use proper words in appropriate contexts?”, “Will my readers understand the idea that I’m trying to express?”… Have no fear though. Technology, in particular, the Internet, has advanced a lot in the last forty years. An author can make their life easier by using a wide variety of tools. I’ve done my homework myself and have found some very useful writing apps. Below is the list of 9 best writing apps that can help improve your English writing skills. Let’s read on to discover your favorite ones! Grammarly is a popular writing tool that is used by a large number of users online. Boasting a clean design, Grammarly will help you get through your work as fast as possible. Grammarly is a proofreading tool. It can point out your grammatical mistakes, spelling errors. Moreover, it offers detailed explanations of grammar rules and of course, suggested adjustments. If you often write in English, it can be very handy at times. To check your writings, simply create an account at the official website (app.grammarly.com). 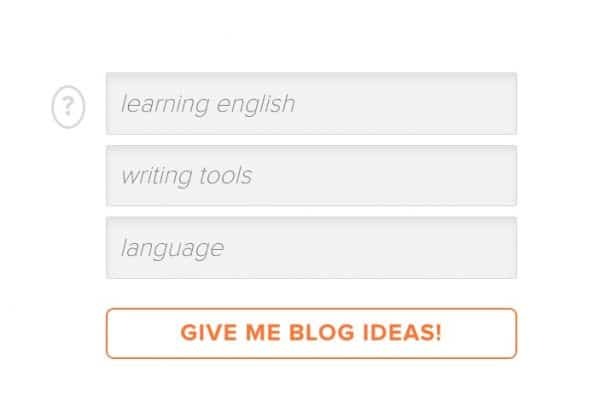 With this, you’re able to upload your writings to check for grammar and spelling mistakes. Then, you can select to download the corrected ones back to your computer. You can also do a quick check by copying/pasting the texts into its interface. In my opinion, you should download and install the app on your personal computer. It will help check your work in the Microsoft Office. (on Windows only, sorry Apple lovers. You are out of luck). However, what made me fall in love with Grammarly is its exceptional extension. Install the browser extension and it will proofread everything you’ve written. (Yes, even your Facebook status update.) It’s available on Google Chrome, Mozilla Firefox and Apple Safari. And there is no hidden fee! It costs nothing at all to make your writings error-free. Grammarly Inc. also offers a paid service, the Premium app. This service checks for a larger range of mistakes, identify plagiarism. It will take your writing styles and word choices into account, too. Grammarly helps you correct grammatical and spelling errors while writing in English. You can learn from your mistakes to improve your English writing skills. You can choose between UK and US English. Very easy to use, partly due to its simple interface. It can check a long writing. Most writers will be happy with free features. 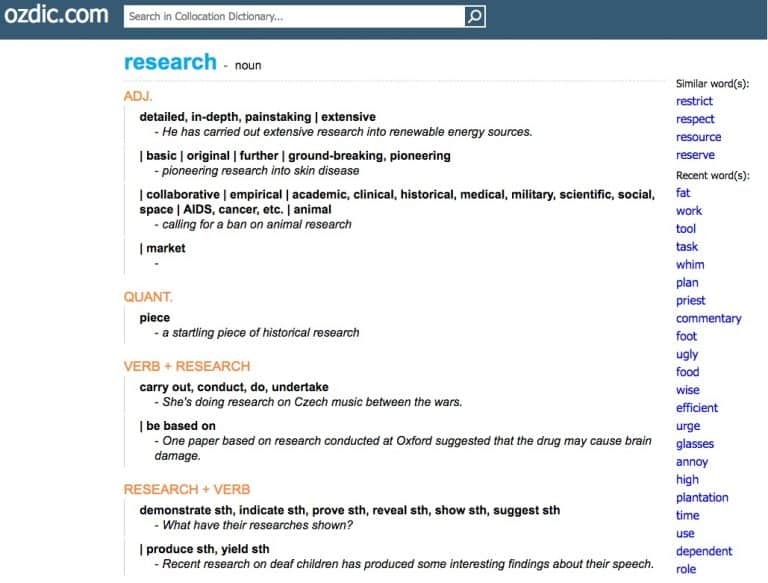 Users are able to look up words and see synonym suggestions right in the app. This makes writing very convenient. Its mobile version is kind of… meh. I mean, it’s usable, but it’s not as exceptional as the desktop one. Grammarly is available on iOS and Android as a third-party keyboard. It checks your writings in real time, but that’s it. Read more about it here. Some websites are not supported. No, you can’t use Grammarly for Microsoft Office on your brand new $2000 Macbook. Named after the famous American writer Ernest Hemingway, Hemingway Editor is a fantastic tool. It’s fast, clean and simple. Hemingway checks your writing for its understandability and coherence. This app is absolutely useful for journalists and bloggers. However, anybody can make the most out of it. This editor is neat for anyone who wants to have a brief, yet concise writing style. The free online edition has everything you need to experience the power of it. Hemingway Editor will, of course, check grammar and spelling mistakes in your writings. It will also point out passive voices or dull words/sentences and even unnecessary adverbs. Hemingway was well-known for his ‘short but comprehensive sentences’ so you can imagine how the Hemingway app works on your writing. One of the most friendly user interface I’ve ever seen. I love its visually pleasing colorful theme. 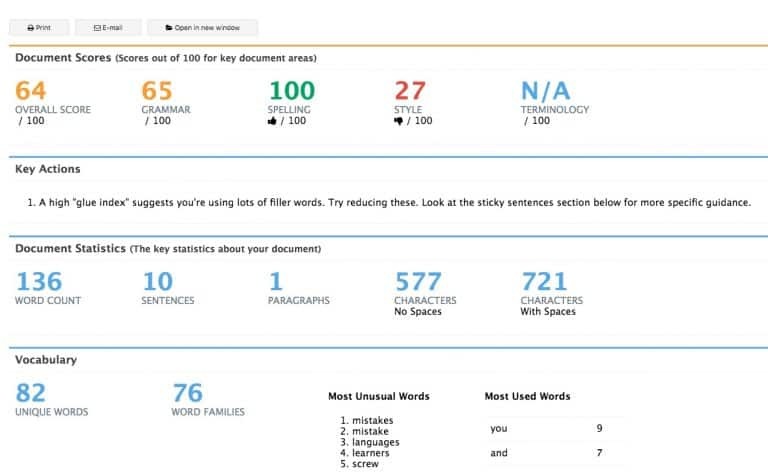 You can see the readability score of your writing in real time. It will make suggestions so you can improve your work. It’s only viable for those who want to pursue a simple writing style. Your sentences will not be very beautiful, but it’s easier to understand. For that reason, I don’t recommend using Hemingway Editor in literary works. You can only type or copy/paste your texts. No, you can’t upload documents from your personal computer. Prowriting aid is not as polished-looking as Grammarly or Hemingway Editor. It offers a lot of features that others don’t. (Provided that you’re willing to dig its menu to get to it). It helps you improve your English writing skills by checking grammar and other mistakes. There are also a lot of stats available. For example, you can examine whether your article contains any duplicated words. If a sentence is too long, you will see warnings, too. You can even check for plagiarism and writing style. The reports of Prowriting aid is usually detailed and very interactive. Hence, you can utilise them to make adjustments. Prowriting aid evaluates your writing on multiple aspects. There is a plagiarism checker in this app. It only examines 3000 words every check. Thus, if you need to analyse a very long document, you have to break them into pieces. Read on to find alternatives, or upgrade to the paid version. There are some limitations on the free version comparing to the premium one. You need to upgrade if you want more information regarding stats and editing. Those who usually write in English should have already known about Thesaurus. It’s the world’s most popular source of synonyms and antonyms. The app groups words according to their similarities in meanings. It’s different from dictionaries as it does not provide the word’s definitions.. For that reason, Thesaurus is great in choosing appropriate words for particular contexts. By using the apps correctly, your writings should be more fluent and easier to read. Yet they will be very comprehensive. This is one of the best writing apps for those who want to improve their English writing skills and their vocabulary. Massive collections of synonyms and antonyms, which are essential while writing in English. Be careful not to misuse this tool. While it’s certainly powerful, there are a few things I am not really a fan of. Thesaurus lists all the words with similar meanings. However, it does not distinguish their differences in connotations nor provide any examples with them. Non-experienced users might use inappropriate words. What is a collocation, you may ask? Don’t worry, we’ve got that covered for you. A collocation is two or more words that go together. To put it in a nutshell, a collocation is a word combination that native speakers tend to use. Think of it like burgers and fries, they always make a pair. If you’re trying to improve your English writing skills, collocations should be on the top of your list. Your writing, with proper collocations, should be similar to the way native speakers write). The problems with collocations is that there are too many of them. Moreover, there is no explanation why we should use that. Ozdic aims to solve these problems. It’s a very good collocation dictionary that shows you how to combine different words. The app includes examples in its database. You will not misunderstand any words. Have you ever written in a language different from your own mother tongue? If so, you will probably notice two things. First, it takes a lot of time and effort to compose a readable piece. Second, you can’t really rely on online translators. Antonio Rotolo designed Ludwig Guru with that in mind. In his opinion, learning a new language is a process. Thus, learners should have an active role. Hence, Ludwig Guru does not work like Google Translate. First, you type in an English piece. Ludwig then compares and contrasts your phrases/sentences with different sources. In the end, it shows you a catalogue of results. That allows users to review their writing combination and learn the proper one. Moreover, you can look up a word while using Ludwig, which makes it very handy for busy writers. Ludwig has an enormous database of examples, comes from reliable sources. They are The New York Times, BBC or scientific researches. It also includes links to these sources so you can verify the context yourselves. There are some limitations to the free accounts. For example, a free account can look up to only 15 queries a day. To write well in English, you need an extensive vocabulary. To be able to use these words you should learn them in their contexts. Remember to use them frequently. Don’t just learn a word once then never use it again. Also, using a wide variety of structures will make your work more vivid as well as fascinating. So, how to expand your vocabulary? The eJOY eXtension is your answer! eJOY eXtension is an extension that makes learning English an interesting experience. The eJOY English team has put their best into developing it. There are a lot of perks when it comes to learning English with eJOY. 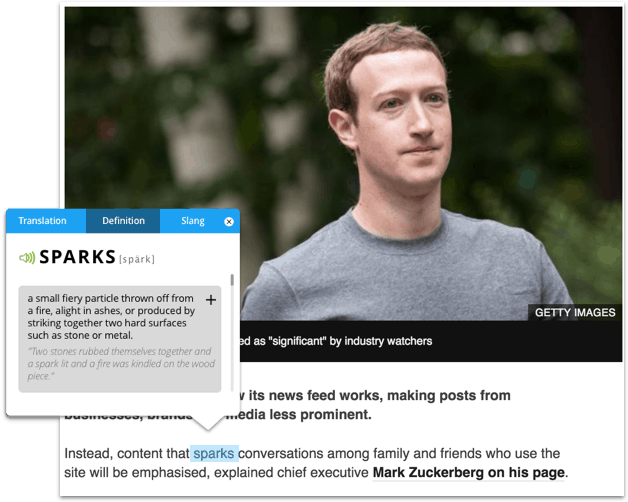 You can save new words/ structures even when you’re browsing the web or reading a blog post. With the eJOY eXtension, you can even look up and save new words while watching YouTube videos or Netflix shows. My most favorite of eJOY eXtension is that you will never learn a word by its meaning only. Instead, eJOY guides you to learn new vocabulary in contexts from relevant videos as well as real-life examples. For that reason, you could understand how to use a word in different situations. eJOY eXtension will remind you to study new vocabulary every day until you actually remember them. It utilizes the Spaced Repetition Method to achieve that. eJOY eXtension also provided detailed reports. Hence, you can actually see your progress with a word, so as to allocate proper time to study it. You can save and learn new words no matter where you are or what are you doing on the Internet. The Word Hunt (‘Say It’) feature is fun and very useful. It finds videos from eJOY’s database to help you learn new words/ phrases in contexts. Engaging game system, which makes learning fun. It’s only suitable for those who can learn on their own. eJOY is a tool that can assist you in studying English, but it’s just a tool. It’s not a mentor, it’s not a teacher or instructor. Thus, if you can’t learn on your own, using eJOY will probably not bring the best results. Download eJOY eXtension free here. English has a large number of words. There are around three-quarters of a million words in the English language. (According to the Oxford Dictionary). Thus, English learners always need to use a dictionary. Why? Because it allows us to understand the meaning of words we haven’t learned. To write or to speak English better, we need dictionaries. You can see a list of them in the article “9 Online Dictionaries”, gathered by eJOY. Quora is a place where its users can ask questions and share their knowledge in different topics. There are a lot of profound and fascinating answers on Quora. Many experts and smart people are also on Quora, which makes discussions quite interesting. 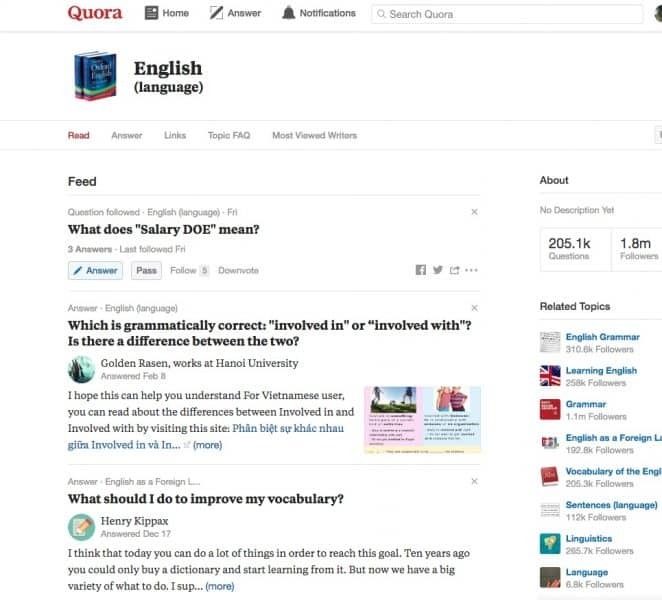 If you want to improve your English writing skills or your knowledge, then you need to be on Quora. So, how does Quora really help you? First, besides enriching your knowledge, you can find unique ideas for your posts. You can also learn many words and structures that might be useful later. But most importantly, Quora allows you to write regularly. The most valuable thing it brings is that you have a chance to share your thinking, your ideas to the world. You can practice using different words in different contexts. You will also learn how to express them in the most convincing order. And Quora is the perfect place to do that. There are a lot of experts from many fields who can give you pieces of advice or feedbacks. You can select your favourite topics. Quora sorts answers by their usefulness. (It depends on upvote, downvote, content, author…). Thus, you can always find the best answer for you. Still, there are quite a lot of spams and meaningless answers. You must have an account to see the answer. Quora requires you to click on “See more” to see a long answer. So, it might cost you some time. Hubspot’s Blog Topic Generator is definitely the best tool for generating topics. Its features aim at those who work in content marketing or blogging industry. However, you can still use this Topic Generator even if you just want to find something to write. So, how does it work? It’s very simple. Put three keywords into the box segment. Hubspot prints out five unique ideas at once. But what if you’re not satisfied with what you’ve got? In that case, hit the ‘try again’ button, and let Hubspot do its magic. For me, five ideas seem to be a good start. In conclusion, it depends on the writers to choose which app to use. There’s always a new, interesting app pops up every time. The best thing about these apps is that most of them are free. It won’t cost you anything to try a new one out whether it suits you or not. Have you used any of these apps mentioned above? Do you agree with my opinions about them? Or do you know some great apps that are not in this article? Tell us more about that in the comment section! Previous article40 Animal Names In English – Do You Know Them All?